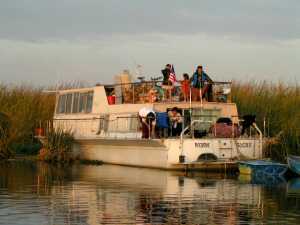 -----If you are wont to stay tied off to a marina overnight, you will have some difficult decisions in the Delta. We counted sixty marinas in a guidebook. They come in every stripe - from rags to riches. -----They represent a true cross-section of the sociology of the Delta. Some are rustic, even a little seedy, and run-down (representing their owners and their customers). Others require a listing in the social register (or perhaps a name, in the Fortune 500, followed by a few letters - CEO, PRES, CFO). Everyone seems to have a favorite that suits their wallet, their libido, or their aspiration. -----Understand, we're cruising nomads - transients, in the name of the trade. We don't have the time or the luxury for a socio-economic analysis of where we're going to buy fuel, take a shower, or go for a walk. Picking a marina for an overnight is almost like choosing a restaurant, and, come to think of it, it often IS choosing a restaurant. If there happens to be an eating place associated with a marina, the choice is often much easier, since our culinary selector 'antenna' is more finely honed than our marina 'sensor.' You have an idea of what you are in for if the marina eatery is "Bubba's," or "Le Grande Expenditure." 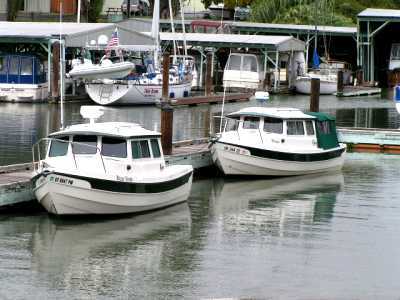 -----If there's no eatery, check the size and quality of the boats - are they all Bayliner, or Grand Banks? Most folks tend to buy one notch above what they can honestly afford, and it gives an indication of the cost/foot for a transient. 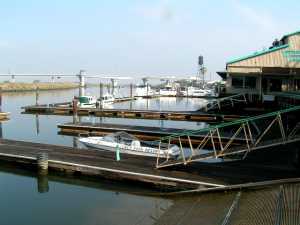 A better selector tool is often the condition of the marina. We have found a key indicator (silly as it sounds) is the condition of the 'rub rails' along the docks. If they're falling apart, dirty, absent, have nails sticking through - so goes the shower. Marina Row, Plotting the Route, Home. -----So, most of the time we prefer to swing on an anchor. We know the condition of the head (and the shower) on our little boat. We have herons for neighbors, and they aren't too noisy or nosey. 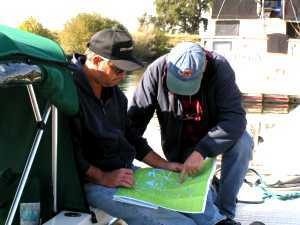 We like to ask locals about their favorite anchorage, and the first thing we discover, is that most don't anchor. If they have small boats, they don't feel they have the necessary amenities. If they have big boats with fancy facilities, they don't trust their yachts to a spindly line and small hook. It can be hard to find information about good anchorages, so we usually find gunkholes on our own. There are many good choices (off-season) here on the Delta - so many sloughs, so little time. ----We have to mention meeting one of the Delta Pioneer folks - Chris Lauritzen III. His family arrived from Denmark three generaions ago and sunk deep roots into the Delta mud. 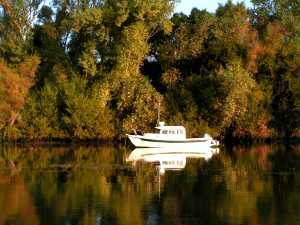 His grandfather ran a fleet of passenger boats in the Delta in the early days. 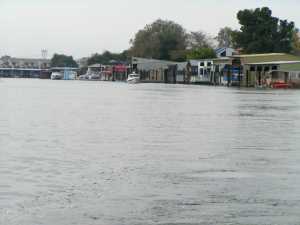 The family operated a car ferry between Antioch and Sheman Island. They ran tugs pushing barges with heavy equipment and cranes. 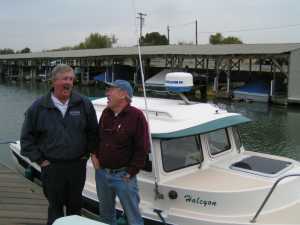 Chris and his family now run a marina and he is full of tales and useful information about the Delta. ----Another interesting person is Diane Kennedy, at Delta Marina. 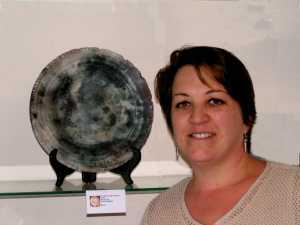 She is not only a good person, but is also a very accomplished potter. Ask her how she throws her pottery and you're in for a fascinating tale. 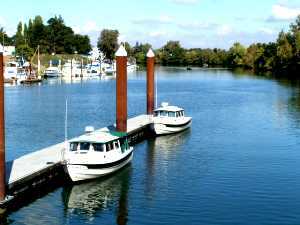 ----So, there are marinas everywhere and you will surely find some that are perfect for your cruising. They have the added advantage of fuel readily available.